The Alameda-Contra Costa Transit District is available here. 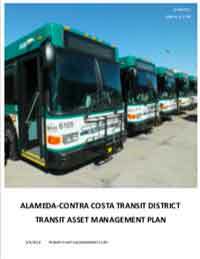 This transit asset management plan was published by AC Transit in March of 2018. AC Transit provides bus service in Alameda and Contra-Costa Counties in California, and is the third-largest bus-only transit provider in the state. AC Transit's Board of Directors recently adopted a Transit Asset Management Policy (Board Policy No. 463), which outlines the District's asset management approach, gives a designee the overall responsibility for overseeing the plan, and sets the course for establishing and carrying out TAM strategies that are compliant with federal regulations and achievable with available funds.